I’ve been itching to write this post every since Friday when I finally took the plunge to straighten my natural hair after not using heat for over a year. It began last April when I decided to cease heat styling. I noticed after regular use of the InStyler that my fine natural hair couldn’t tolerate it. I was straightening my hair weekly after washing mainly because I didn’t know how to style it curly. Then, I noticed something that broke my heart. My crown had broken down to the root! I had only an inch or so of hair there. I knew then that if I wanted to keep my hair on my head that I’d have to change how I cared for it (my crown is now 10 inches long). Now, the heat styling wasn’t the only reason I think my hair broke off. I also realized over time that I can’t use a comb on my fine hair. Finger styling and finger combing is what I need to do to keep breakage at bay. That, along with putting the flat iron away for good. After a year of basking in the versatility of my curly hair and trimming my ends in twists, I needed to see how much length I really gained. I also needed to get a professional trim. Friday I decided to wash, deep condition and detangle my own hair (the way I know how) and then go to a salon in my area and let them blow it straight with the blow dryer. 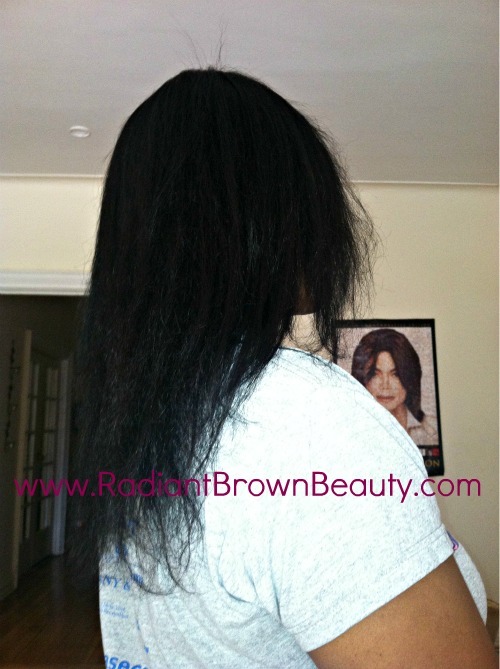 The blow dryer is a lot less damaging than the flat iron since it doesn’t come in direct contact with your hair. That is, unless you let the Dominicans do it which I did LOL. The reason I went to a Dominican salon is because I knew I could achieve the same results as the flat iron without the direct contact of a heat appliance on my hair. Before my trip to the salon, I purchased a heat protectant. Initially, I decided I would use one of two heat protectants I saw recommended on various other blogs. It was going to be Sabino Lok and Blok or Redkin Smooth Down Heat Glide. The problem was I couldn’t find either so when I was in Sally’s Beauty Supply Store, the lady at the counter recommended Beyond The Zone, Turn Up The Heat Heat Protectant Spray. It’s purchased regularly by local salons for professional use. The smell is nice but even more importantly, the spray has a slightly oily consistency that didn’t actually make my hair oily. This makes a perfect heat protectant because it won’t readily evaporate on your hair. 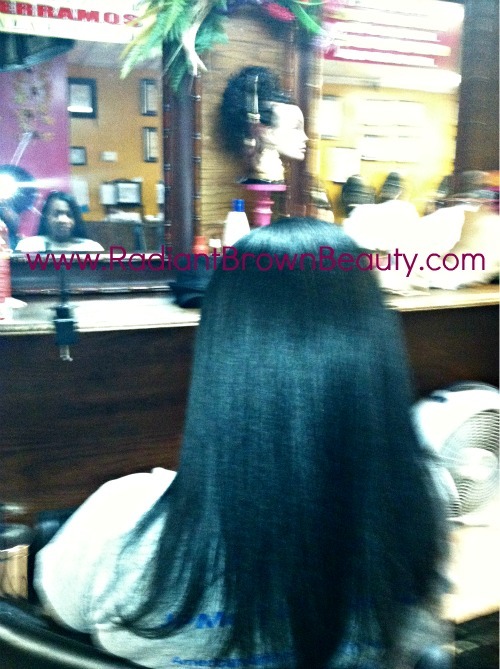 The Dominican salon I went to was the same one I frequented when my hair was relaxed. My hair was never damaged so I figured I’d go back for my blow out. Now, I’ll never go back. Why? Not only was the dryer too darn hot, the owner said some things I didn’t appreciate. When I removed the rollers from my hair, she said that I’m making it harder for her to straighten it because by taking the rollers out my hair before she was ready, my hair is now frizzy. First off, my hair was big not frizzy. Second of all, if you are blowing it straight what does it matter if it’s frizzy big or not? 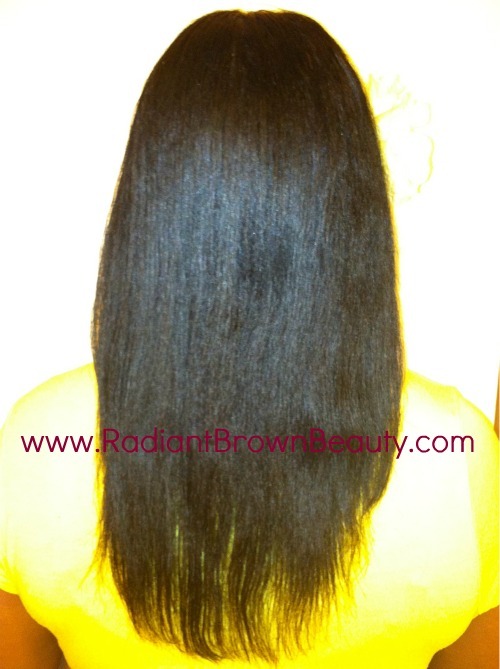 She gave the impression that she felt hair in it’s natural state was not as pretty as straight hair. Anyway, this woman blew my hair straight and while she was very nice I didn’t like how she tugged and pulled at my hair. I motioned several times for her to lighten up but she just didn’t get it. Perhaps I should have went some place where they spoke English! I was going to get a trim but after the comments and steamy dryer, I decided against it. I may have had to turn the place out. She ran her hand through my hair to pin it up while waiting. Some hair came out in her hand – long strands. There may have been a little breakage after my hair was ripped through to put the rollers in but for the most part the hair she felt come out was long strands. 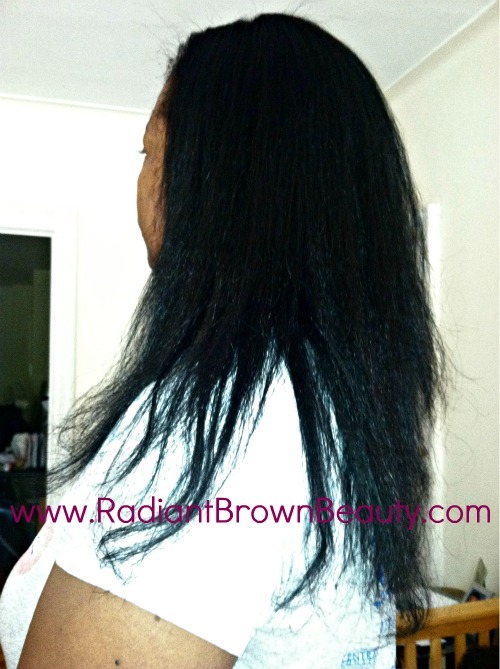 There’s a difference between shedding and breakage. I Actually Got a Trim! This past weekend I was away at a retreat and during the time, we went to the Gallery Mall in White Plains, New York. I was walking around browsing when I noticed a salon. I went in and watched how they styled hair. I was impressed with the diversity of clientele and stylists so I decided to ask if they trimmed hair dry. They did so I decided to give them a whirl. I’m glad I did too. Not only were they affordable, the stylist trimmed my hair exactly the way I asked her to. She started by showing me how much she thought should be trimmed. It was too much for my liking and I showed her how much I wanted it trimmed. In a future post I’ll share some of the hairstyles I’ve been wearing with this straight hair. Some of them will be from when I was on the retreat and others will be styles I’ve worn during the week. Previous PostTerressentials Pure Earth Hair Wash – Yay or Nay? I can’t believe those people said that??? They are crazy!! Anywho, love your hair Michelle. I tried straightening my hair myself and it was not happening! I’m trying to find a natural salon in my area and have them do it. I go anyplace else and they want to fry my hair half to death! Thanks MJ. It would be good if you could get a referral from someone. It’s so hard to go places and put your hair in people’s hands not knowing if they will treat it the way you would like. Thanks Leah. Even if you do decide on a trim you just have to be clear on how much is acceptable. Make them show you with your hands the way my new stylist did. I really liked that she did that before she started cutting. My ends were pretty scraggly looking but that was mainly due to the different lengths and not necessarily splits. I’m letting it fill in on its own over time. I may trim at the end of the year though. Considering the abuse the stylist did to your head your hair looks healthy. I think it is so hard to find a stylist that gets what we want with our hair. My stylist actually called me to ask if I was over my “natural hair phase”. Can you believe that! Anyway, your hair looks fabulous! Your crown has grown in really nicely. Thanks Jen. I guess 1 day of abuse didn’t do much harm but I am definitely taking care of my own hair for the most part. I’ll only be getting a trim 1-2 times per year to get it blown out. I’m going back to the salon I found at the mall. I’m chiming in on that one!! “Natural hair phase?” You know, it kills me when people lack complete common sense. You have a business, do you think you get clients by insulting them? Seriously. People need to learn how to keep it to themselves when they don’t have anything nice to say. I’m actually surprised you let a Dominican touch your hair with their HOT blow dryers. Your hair came out really nice after the trim and everything though. I figured one time wouldn’t hurt just for the straightness I wanted to get but I’m definitely not going to them again. I’m going back to that salon in the mall when I’m ready. Okay, where are the comparison shots?!?! You know, I should be working out right now!! I’m such a loser! Gotta go! Oh, and although your perimeter is thin/wispy, your hair looks very healthy!! Your crown has grown a ton!!! If you keep it trimmed at the length it is, do you think it’ll fill in completely in about 8 months? Oh, and yeah … I had a similar, though not identical, experience at a Dominican salon when I went to get a blow-out 2 years ago. I wouldn’t let them trim my hair either!! I had someone that I trusted for that … thing is, the stylist was so hood, I haven’t been back in the last couple of years. She also cuts on straightened hair, so if I don’t want that, I can’t go there. Okay, going to get dressed and work out now!! You’re the one having to motivate me now!! I couldn’t find any from last year! I have one in my car but it doesn’t show he back of my hair only the side.